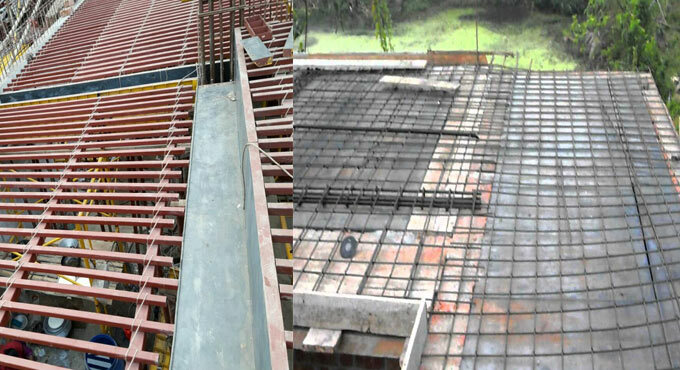 RCC false slab stands for a slab that is located under or over the main floor slab. The false slabs are formed for different purposes. Some false slabs are created for the interior purpose and some other for concealing air conditioning ducts as well as any unnecessary things. In this article, detail information is given for the false slab that is used in bathrooms for concealing the sanitary pipes, traps, fittings, etc. The false slabs are formed with several types of materials. But, RCC (reinforced cement concrete) false slab is mostly recognized in bathrooms. The sanitary pipes laid on the false slab can be repaired easily. Due to leakage in the joint of sanitary fittings, the water may fall directly in the bathroom, but false slab can be used to get rid of this issue. The inhabitants can utilize this for retaining different household things. Usually, seven feet of distance should be maintained among the bathroom floor and the false ceiling. It is treated as the clear height of the bathroom. If the clear height is under 7′, lots of issue will be raised. Therefore, it is necessary to retain the false at 7′-2″ over the floor. When the tiles will be set up on the bathroom floor, it’ll be elevated 2″. Hence, the clear height of bathrooms should be verified properly prior to cast RCC false slab in it. The level of all lintel and false slab on a floor should remain identical. For this reason, a level on the floor is settled. Generally, the level is chosen from the front of the lift lobby or stair lobby. Mark the level on a column in the lobby area. Get that level to all flats in that floor. Prior to cast any false slab, verify the level of the slab relating to the level settled in the column of the lobby area. It should be done prior to cast false slabs to ensure all the lintels and false slabs remain at the similar level on the floor. The false slab of a bathroom should be perfectly horizontal. Because, if one side of the false slab is raised and another side is down, the problem will arise at the time of wall tiling work of the bathroom. To make the false slab perfectly horizontal, mark the level in the all four walls of the bathroom by applying a water level pipe. Now verify the spacing among the level mark and the bottom of the false slab in all four sides. If the distances are identical in all sides, then the false slab is perfectly horizontal.